The Vidamar Resort is a wonderful, private self-contained holiday resort that is located extremely close to the Salgados beach and golf course, as well as being within a ten minute drive of Albufeira. The Vidamar Resort is a wonderful, private self-contained holiday resort that is located extremely close to the Salgados beach and golf course, as well as being within a ten minute drive of Albufeira. Situated in the heart of a holiday village, clients staying in the private villa also gain access to the sublime spa, the active gym and fitness classes as well as the modern restaurant in the 5 star hotel close by! The contemporary styled villas are spacious and offer sought after amenities. With the fully interactive kids' club on-site, this resort is perfect for families and couples alike, promoting fun in a safe and secure environment. The resort offers an array of facilities and amenities, which will leave you wanting for nothing whilst on holiday! Located within a stone's throw of the resort is the Salgados Golf Club, where you can play or fine tune your game! Open all year, between 07:30-20:00, with tee times every 8 minutes from 08:00. 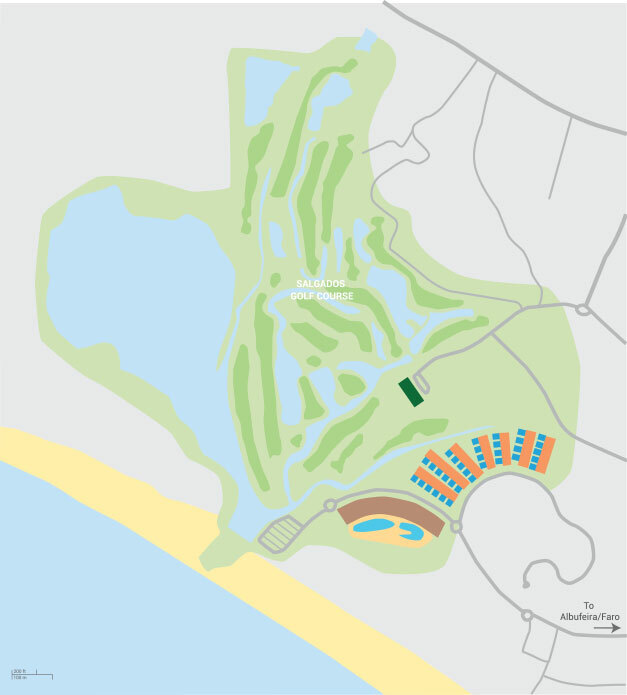 The Salgados Golf Course is located near Albufeira, within a protected natural wildlife reserve. This 18 hole course provides golfers with a unique setting and the sea view adds to this scenic golfing experience. The VidaClub Kids Club is open for 4-11 year olds is free of charge, and provides exciting activities to keep children occupied. With entertainment planned on some evenings as well, children will love this resort! Open all year round, 7 days a week, from 10am -1pm and 2:30pm - 6pm. During low season the club will be closed on Sundays. Open all year round, 7 days a week, between 10am - 8pm. Opening times may vary in low season. The Spa provides you with treatments and relaxation programmes which have been designed with your well being in mind. An indoor heated pool is available, you must wear a swimming gap. Access to the indoor heated pool has no age restriction but must be accompanied by a supervising adult. Ensure your nails look super on holiday! Spa access is approximately €20 per day. Treatments start from around €5. There are three stunning salt water communal pools situated around the resort including a childrens pool, circular adult pools and one indoor pool located in the spa. Open all year round, these pools are the perfect place to kick back and relax in the Portuguese sun. Open all season, 7 days a week, from 9am - 7pm. Enjoy a wide variety of drinking and dining options at the resort in the bars and restaurants, ranging from light snacks in the pool bar to delicious three course meals as well. There are three restaurants to choose from, offering International, Italian, Seafood and Oriental Cuisine! There are also a few bars on resort, offering coffees during the day and then some light refreshments in the evenings. Open for dinner only and as an adult only dining experience, the AJI Oriental Flavours restaurant offers guests the best in Japanese gastronomic fusion. The atmosphere is informal and contemporary as well as the design, allowing the presence of the Chef in the room! Prices start from approximately €3 for individual sushi and range from around €12.50-€32 for combinations. The Sunset Snack bar is located by the outdoor swimming pools, next to the Salgados beach access, it offers a fantastic terrace where you can enjoy the selection of fruit juices, shakes, soft drinks and cocktails. Snacks haven’t been forgotten you can choose from a range of salads and sandwiches, prices range from approximately €3-€10, with a children's menu also on offer ranging from around €4-€9. The Lisboa Bar presents you with a smart casual ambiance and is the place to enjoy a selection of gin, whiskies, cocktails and spirits. Located in the Central Wing of the hotel, very close to the Hotel Lobby. There is also a selection of sandwiches and light snacks on offer, ranging from approximately €4-€11.50 and an adults only zone. The Ocean Buffet Restaurant is located within the hotel building and here you can take advantage of the large outdoor terrace with a fantastic view to the swimming pools and the resort’s Palm Gardens. Start your day with a sumptuous and diversified breakfast or make the most of the varied options available for dinner. The Mamma Mia restaurant features a range of classic and regional Italian dishes, with popular homemade pastas and pizza dishes cooked in a wood-fired oven, without forgetting the Antipasti and a selection of Insalatas. There is also an outside garden terrace for alfresco dining, where guests can enjoy a panoramic view over the sand dunes. The laidback and informal atmosphere makes this restaurant the place for a memorable dinner. The Wet Bar is actually located in one of the 3 resorts’ outdoor salt water pools, allowing you to enjoy a drink or your favourite cocktail while you relax in one of the sun lounges under the water. Take advantage of this swim-up bar to relax and enjoy a refreshment with one of our fantastic drinks without leaving the pool. Open during the day only. Located just 500 metres from the resort, Salgados beach is 7 kilometres of fine white sand, clear blue seas and all the Algarve sunshine that you could wish for. With sun loungers available, as well as parasols, this beach is the ideal place for all of the family! Reservation should be made at the reception 2 hours prior to departure and it’s subject to availability. WiFi internet is available in all public areas of the resort. If you have a late departure you can use the facilities of the hotel (showers, pools, storage facilities, restaurants and bars). We loved the resort and villa and can recommend as a brilliant family holiday. The staff were amazing couldn't help you enough. We loved the Villa and settings and enjoyed our stay and would recommend James Villas (with certain reservations) But bearing in mind the actual cost for 5 days (£2,374) the actual quality inside the Villa let the overall opinion down. The TV in the 2nd room could only be watched by unplugging the bedside light as only one plug available, the cupboard only opened six inches as blocked by an opening on the ceiling, the TV in the main lounge had exposed wires dangling down the wall, the coffee sachets did not fit the coffee maker. It would have been very helpful if the menus (and costs) of the four restaurants and local services such as Taxis and maybe takeaways were available in the Villa. I appreciate all minor points and not critical but let the "image" of the renowned high standard of James Villa. Also we had paid for a greet and meet and found a card on the table to ring Alison. WE rang at 4.15 pm, 15 minutes after we arrived and she informed us we could see her "some time" the next day. This was of very little use to us and in the end we did not bother. The needs to be reviewed. Finally we can not praise enough Jet2.com their services flights etc were of the highest standad. Very nice villa in good location with good facilities. Only fault is the villa was in need of some repair/ decoration.eg plaster/ paint off walls in several areas- bedroom and lounge area. Sofas required inside no relaxed seating. Outside area & upstairs terraces needs outside furniture. Bedrooms need mirrors near plugs to dry hair & towel rails to dry towels on. Lovely villa, very spacious. Felt modern and clean. Hotel style bedrooms and bathrooms. The Villa was excellent but a few teething problems on arrival. Kettle was broke, lights downstairs in the Hall didn’t work, the sliding doors in the master bedroom didn’t close, no privacy blind on the landing meaning next door had full view and the air conditioning unit was broke and the compressor needed changing which meant no air con for a full 2 days. We were offered a mere £40 compensation for the trouble which in my opinion did you no favours at all as we have 2 children. This has put doubt in my mind as to wether I will book with James villa again. negatives, we had to get maintanence in to fix toilet seat, toilet flush and replace the main bathroom sink. dishwasher was dated and not maintaned. It was just little things like kitchen door does not close but for the money we paid for this villa you would expect all of these to be polished. The villa was just not as polished as it should be for that money. ANTS are a problem they were everywhere and we had to put powder down in most rooms but this didnt seem to stop them. The villa was really nice, but the bed was the hardest bed I have ever slept on. The arm chairs were worn and stained too and the side tables and coffee tables were impractical although they looked nice. I go the gym frequently so wanted to use the facilities at the hotel. To say they were poor is an understatement, they were in a tiny room were there was no working air con and frequently no cups for the water machine, the equipment was basic, old and poor quality. The hotel looked good and the beach and pools were beautiful, I just couldn't understand why there wasnt consistent quality. Also, as a note, it was annoying that on the Friday night, the only adult only bar was closed for a wedding party that weren't even using it.